With this remarkable, eye-opening book and its companion Web site, Nicholas G. (Nick) Tomaiuolo shows how anyone can create a comprehensive personal library using no-cost Web resources. And when Nick says "library" he’s not talking about a dictionary and thesaurus on your desktop: he means a vast, rich collection of data, documents, and images that--if you follow his instructions to the letter--can rival the holdings of many traditional libraries. If you were to calculate the expense of purchasing the hundreds of print and fee-based electronic publications that are available for free with "The Web Library" you’d quickly recognize the potential of this book to save you thousands, if not millions of dollars (fortunately, Nick does the calculating for you!). This is an easy-to-use guide, with chapters organized into sections corresponding to departments in a physical library. 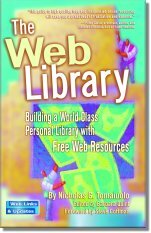 The Web Library provides a wealth of URLs and examples of free material you can start using right away, but best of all it offers techniques for finding and collecting new content as the Web evolves. Start building your personal Web library today!